Citroen Survolt | What Car? 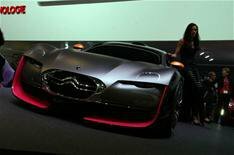 Citroen's centrepiece at Geneva is this Survolt Concept Car. Citroen says the Survolt is an evolution of the Revolte concept car (also on show here) at the Frankfurt motor show last year. While the Revolt is a hybrid supermini inspired by the iconic 2 CV, but this Survolt is a seriously sporty two-seater. Citroen is saying little in the way of technical details here at Geneva, and instead focuses on the car's striking looks.